We are always looking for volunteers to participate in the “Learning to Grow” program at the Women’s Community Correctional Center in Kailua. Currently we have 6 volunteer teachers who each go to the Garden 1 day a week for 2 hours, on Mondays, Wednesdays and Fridays from 8-10 AM. We also need drivers to deliver lettuce grown at the facility, to Foodland stores around Oahu, every other Wednesday. We who volunteer all consider it a privilege to do this work and enjoy it immensely. If you would enjoy being a mentor gardener at the correctional facility or helping in any way, click here to get in touch with a coordinator. It is such rewarding work! We will give you details about the program and how it can fit in with your schedule. It is so rewarding and interesting, and we invite you to come to visit once or twice so you can decide if you want to contribute. Before entry, you will need to provide full name, date of birth and Social Security number to the Sergeant in charge. There is also a dress code and rules about what cannot be brought into the prison, which will be discussed with guests and new volunteers. Please visit our LKOC/WCCC Partnership page for more details on the program. 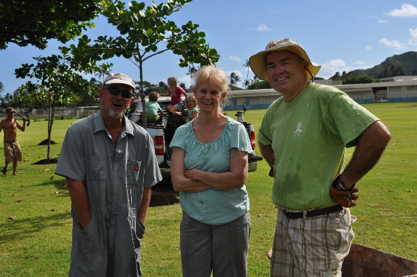 Lani-Kailua Outdoor Circle has “adopted” the grounds at the Boettcher Estate, Kalama Beach Park. We are committing to maintenance of the naupaka hedges and removal of invasive species such as ivy gourd and Christmas berry on a quarterly basis. We held a work day on June 24, 2017, where truckloads of green waste were collected and removed from the property, including invasive ground cover and Christmas berry, overgrown naupaka, seagrape, and carrissa, and existing piles green waste debris. We also pruned several trees. If you would like to be a part of the crew who is helping renovate Kalama Beach Park grounds, click here to let us know, and we will notify you via email as workdays are scheduled. You will need to wear closed shoes, work gloves (if you have some), clothing to protect yourself from the sun, and bring a water bottle. A​pril 2017: Mahalo! 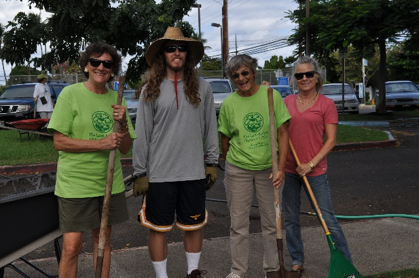 to volunteers who recently cleaned up the Hamakua Drive/Kailua Road corner abutting the marsh. 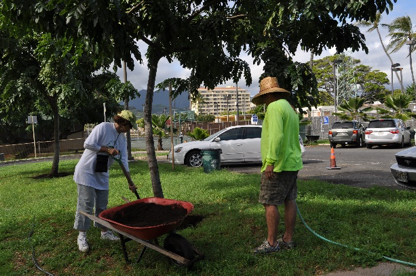 ​From time to time, we will schedule work days to spruce up areas of Kailua that are looking like no one cares. We will post the work days on this site, but if you would like to be put on a list to be notified by email when a workday is scheduled, please email us a message by clicking here.